Microsoft Sound Mapping: uses Windows' default audio device. [Soundcard]: WaveOut to your soundcard, this one always works. You will see multiple entries if you have multiple outputs on your soundcard (or if you have multiple soundcards). WAV-writer: write the audio to an uncompressed WAV-file (see File writing below). If you choose 32-bit resolution (below), XMPlay creates 32-bit floating point audio. WAV-writer - normalize: same as WAV-writer, but the volume is as high as possible without clipping. Encoder - various: send the audio to a command line encoder, see Encoders. ASIO: to your soundcard via low-latency ASIO. DirectSound: to your soundcard via Microsoft DirectSound. WASAPI: to your soundcard using Windows Audio Session API (WASAPI). The last three types will only be available if you have the respective output plugins installed. The Sample rate dropdown box determines the sample rate in Hz. Channels sets the number of channels, mono or stereo. Resolution is the resolution at which the data is sent to the soundcard. 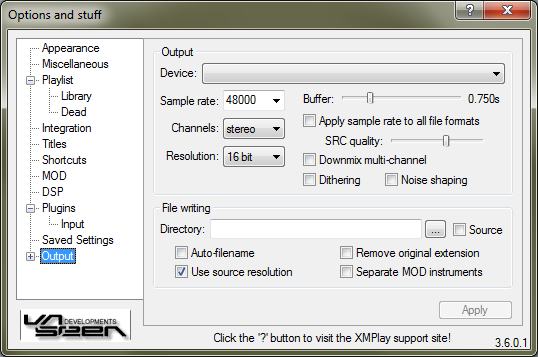 The Buffer slider sets the amount of audio XMPlay keeps in the output buffer, to prevent hiccups. Normally, the sample rate only applies to module formats, stream formats are outputted at their own sample rate (or higher, if the soundcard doesn't support the original sample rate). If you tick Apply sample rate to all file formats, all output is resampled to the sample rate you choose before it is sent to the output device. You can choose the resampling algorithm quality with the SRC quality slider (left=lowest quality with 4 points, right=highest quality with 128 points). Multi-channel audio is only downmixed if you tick Downmix multi-channel. Dither adds white noise to the audio to randomize quantization problems, and Noise shaping improves the process quality when lowering the audio resolution. Changing any of these settings requires the output device to be re-initialized, so hit the Apply button to activate the new settings. In the Directory box, you can choose a default directory to write files to. Ticking the Source box will have XMPlay write the file to the same directory as the input file. Once you start a file-writing process (either with the WAV-writer or with an encoder), XMPlay will pop up a dialog box asking for the output filename. Checking Auto-filename will give the output file the same name as the input file, with the new extension added. Remove original extension will remove the extension of the input file from the output filename (e.g. file.wav instead of file.mo3.wav). Use source resolution is for lossless tracks, so the output file has the same resolution as the input file, making your output truly lossless. If you're writing a module file, you can create a separate output file for each instrument by ticking Separate MOD instruments. The instrument number is added at the end of the output filename.